Yoga & Tantra Package | Ayurvedic in india | Ananda Fitness Destination Spa. Ayurveda, Yoga & Tantra are all part of he ancient life discipline that have been practiced in India for centes. They find mention in the scriptures of the Vedas and Upanishads. Yoga is the science of the union with the Divine ,with truth;tantra is the most direct method of controlling the energy that creates the ultimate union with Truth and Ayurveda is the science of life. The purpose of each practice is to help the individual achieve longevity, rejjuvenation and self-realisation. The object of practices of Yoga & Tantra is liberation, although only certain disciplined individuals are able to achieve ultimate goals through these practices. If Ayurveda is the science of body, Yoga is science of spirit. They are sister sciences. The practice of Yoga is an important, natural ,preventive meature to ensure good health. The father of Yoga, Patanjali, described eight areas of Yoga and Yogic practices as follow: the natural regulation of nervous system discipline cleansing postures concentration contemplation the awakening of awareness and the state of perfect equilibrium. Yogic exercises have both preventive and curative value. They bring man to the natural state of tranquility, which is equilibrium. Yoga session in progress Employing Ayurvedic diaggnosis and treatment, yogis deal effectively with these disorders. 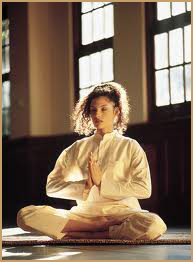 Ayurveda indicate which type of yoga is suitable for different constitu- -tions. Benefits of meditation include a greater sense of relax- ation in both mind & body, greater flexibility of thinking, an ability to meet situation with freshness and insight. From the standpoint of pure physical expression it can help loosen the knots and tensions trapped in the body by distributing emotions.It can help to change both facial expression and body posture, thereby softening and strengthening at the sametime. There are some of possible results, but they are not the goals. Meditation helps strengthen the positive qualities of compassion, patience and wisdom and free us of conflicting emotions and erroneous beliefs. Meditation There are many form of meditation: silent sitting, chanting, praying, walking meditation, meditation that uses visualization or focus on objects. Meditation can be found in almost every tradition in world if one were to look into their more contemplative practices. Samadi is the state of highest equilibrium during meditation, when the individual consciousness merges into the Cosmic Consiousness. All limitations vanish, the individual consious- -ness empties itself and in that emptying process. Life changes and daily living becomes a new and fresh experience. In the spiritual evolution of man, Ayurveda is a foundation, Yoga is the body and Tantra is a head. It is necessary first to understand Ayurveda in order to experience the practices of Yoga & Tantra. Thus Ayurveda, Yoga, Tantra form an independent Trinity of life. None of these practices stand alone. The health of body,mind & consiousness depends on the knowledge and practice of these three in daily life.